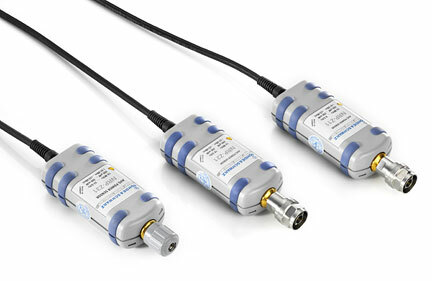 The three-path concept of the R&S®NRP-Z11/R&S®NRP-Z2x/R&S®NRP-Z3x universal power sensors uses three separate diode paths, each operated in the optimum detector range. As a result, the average power can be determined with high accuracy independent of the modulation type. Measurement results are hardly affected by interfering signals or harmonics. This behavior is similar to the behavior of thermal power sensors. The dynamic range is 90 dB with a lower measurement limit of –67 dBm. 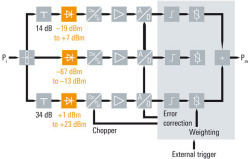 In contrast to conventional multipath technology, adjacent diode paths overlap by 6 dB each. All paths are continuously and simultaneously measured. The final measurement result is achieved by appropriately weighting the measurement results of all paths, which ensures a smooth transition between measurement paths. 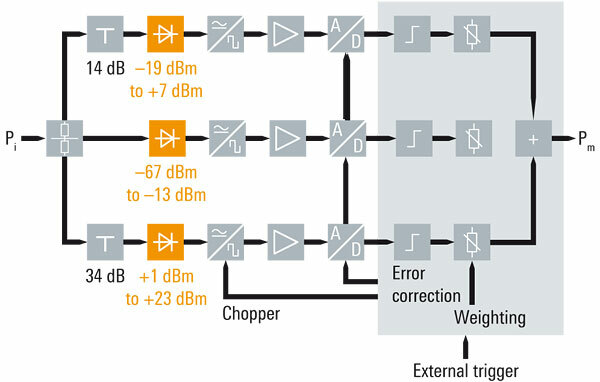 Problems due to hard switching between the measurement paths, such as additional measurement delays and differential nonlinearity, are eliminated. The patented sensor architecture also improves the signal-to-noise ratio and increases measurement speed in the transition region. R&S®NRP-Z11/R&S®NRP-Z21/R&S®NRP-Z31 three-path diode power sensors. The R&S®NRP-Z22/R&S®NRP-Z23/R&S®NRP-Z24 high-power sensors consist of an R&S®NRP-Z21 and a detachable upstream attenuator and are able to perform power measurements of up to 2 W, 15 W and 30 W. After removing the attenuator, the sensor can be used alone as an R&S®NRP-Z21. 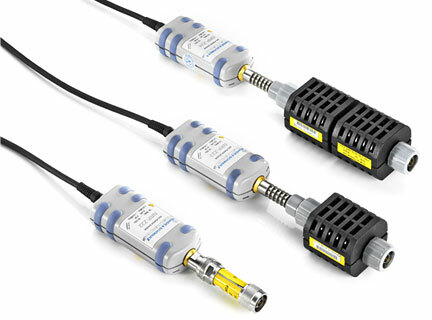 When used with the attenuator, mismatch errors between sensor and attenuator are automatically corrected. The S-parameters for the attenuator are determined and stored in the sensor during production. They are then automatically taken into account when performing measurements. R&S®NRP-Z22/R&S®NRP-Z23/R&S®NRP-Z24 three-path diode power sensors for high-power applications up to 30 W.